Application: This tier one automotive manufacturer plant handles auto components including this large drive train part. The boxes weigh approximately 50 pounds. They come down a roller conveyor to operators, who must then load them onto a pallet at a rate of about 3-4 boxes each minute. The boxes are presented in a horizontal position and must be palletized in a vertical position. Alternatives: The customer had considered using a vacuum tube lifter, but it was decided this was going to be difficult to move and control. The customer wanted to make sure that the operators would use the industrial lift assist chosen, and not go back to moving them manually thus preventing further back injuries and productivity. 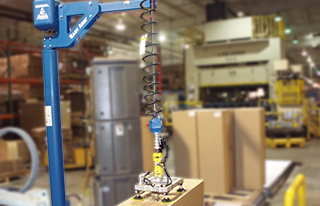 Solution: Ergonomic Partners used an Easy Arm Intelligent Lifting Arm with a Vacuum Lift Assist tool. This was due to a renewed push for ergonomics in this factory. The compact Easy Arm design, which gave them the G-Force technology, was the best fit their needs. Because the Easy Arm is easier to control and move than the vacuum lifter, operators are more likely to use it and less likely to hurt themselves by lifting the 50 pound boxes manually. In addition, the in-line grip handle allowed the operator to control the load with one hand, leaving a free hand to help maneuver the load. This was critical, as the operators had to consistently pick up on the upper portion of the box, allowing the manufacturing lift assist to manually rotate the boxes to vertical. This motion is how the operators were previously lifting the part. By not changing the way the operators typically lifted the part, the operators were able to use the tool with very minimal training. Ergonomic Partners can come to your facility and provide an on-site lifting demonstration of the Gorbel Easy Arm and G-Force intelligent assisted lifting device (IAD). Please contact us today. Ergonomic Partners serves clients from coast to coast, Canada, Mexico and especially focused in the states of Missouri, Illinois, Indiana, Kansas, Arkansas, Mississippi, Nebraska, Tennessee, Kentucky, Iowa, and Oklahoma.